Two sets of opinion surveys highlighted how far ahead the Australian population is on climate and energy policy than the Federal Government and Liberal and National party policy. The opinion polling by Essential Vision provides a national snapshot in areas such as belief in climate change, Labor's 50 per cent by 2030 renewables target, cause of the recent electricity blackouts in South Australia, whether renewables are a solution for our future energy needs, whether the Federal Government is doing enough on clean energy, and attitude to building more coal fired power stations. The Victorian survey was larger and more nuanced by a private survey consultancy done for Sustainability Victoria. It showed much greater degree of support for climate action, renewables, the Victorian Renewable Energy Target (VRET), and the Victorian zero emissions by 2050 target. There was a high self-efficacy that everyone: individuals, businesses, environment groups, and the 3 levels of government, need to be taking considerable climate action, and that this should preferably be lead by the Federal Government. It is notable that just last week the Coalition parties in Queensland, Victoria and South Australia all decided to abolish any state imposed renewable energy targets. This action would seems to be at odds with national opinion, but especially so in Victoria where there is much greater awareness and sense of urgency in tackling climate change. 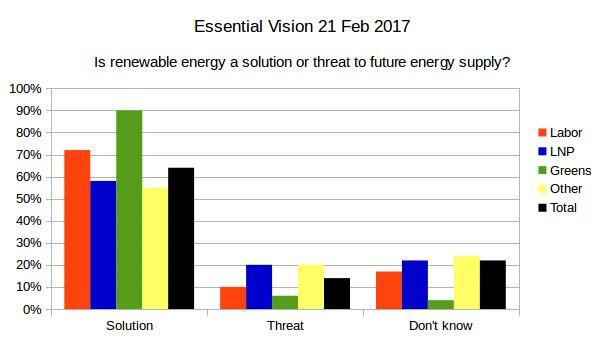 Opposition to the VRET appears to be a major backflip for Shadow minister for Renewables David Southwick. The results should bolster the Federal Labor leadership under Bill Shorten to stick with their 50 per cent renewable energy target and ambitious climate policy that includes introduction of an Energy Intensity Scheme for the electricity generation industry. For Turnbull, the results show his governments attacks on renewables and talking up 'clean coal' are not cutting through. In fact arguing against public opinion is probably making things worse in lowering public esteem for the Liberal Party. The Victorian survey was released on the same day the Victorian Climate Change Act passed the Legislative Council (Upper house) and augers well for introduction of a Victorian Renewable Energy Target (VRET) through legislation later in the year. Essential Polling released results of several questions in national public opinion polling this week on climate change, renewables, coal fired power and energy. First up, on whether human climate change is happening or whether it is just natural weather variability: 60 per cent (up 6 per cent since December) agree that climate change is happening and is caused by human activity and 25 per cent (down 2 per cent) believe that we may just be witnessing a normal fluctuation in the earth’s climate. There is a political split, age group split, and education split. 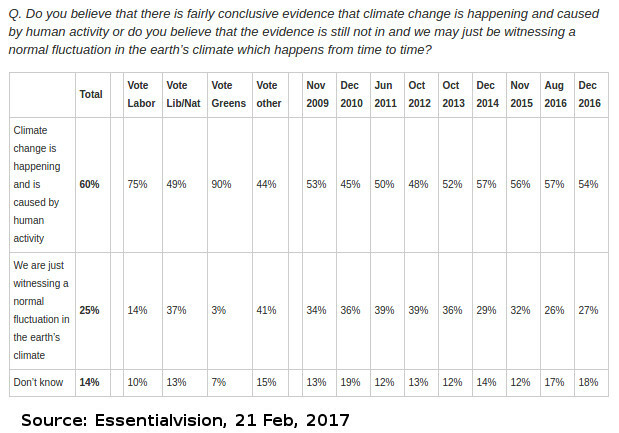 By political voter intention Greens and Labor strongly concurr with the science, while 49 per cent of Liberal voters agree. By age groups, those aged under 35 split 70 per cent / 15 per cent and those aged 55+ split 47 per cent / 40 per cent. People with higher education were more likely to think climate change is happening and is caused by human activity – those with university degrees split 72 per cent versus 19 per cent. Here is the change in opinion graphed from Essential polling data from 2009 to 2017. 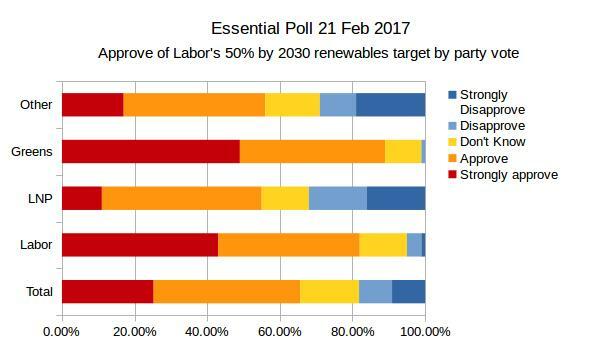 The second question was on Labor's 50 per cent renewables target. The poll found 65 per cent approval to just 18 per cent disapproval. For Liberal/National party voters, 55 per cent approved against 32 per cent disapproval. This does not auger to well for Turnbull and Frydenberg's attacks on Labor's 50 per cent renewables targets. It seems to go against even a majority of their own supporters. This is a popular policy with little change in support from the previous poll in 2015 advises the pollster. A third question asked about the cause of recent blackouts in South Australia and whether they were caused by too much reliance on renewable energy, or to failures of the energy market in responding to extreme weather events, or due mainly to the privatization of electricity supply. The split? 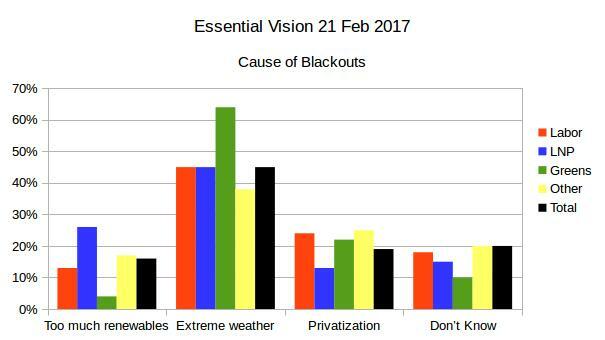 45 per cent attributed the blackouts on extreme weather events, 19 per cent to privatization, and only 16 per cent to too much reliance on renewable energy. The pollsters note that 26 per cent of Liberal National voters think they are due to a reliance on renewable energy, while 51 per cent of those with university education think they are due mainly to failures of the energy market. 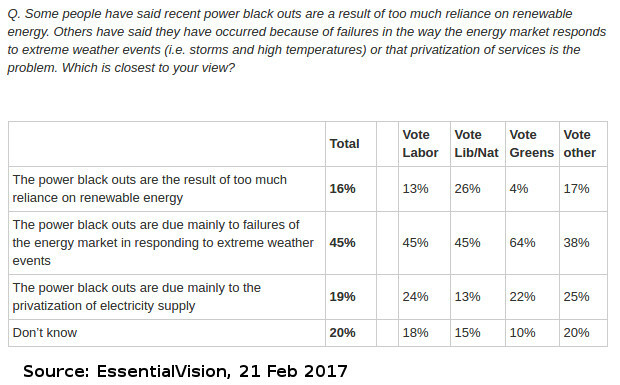 Of those polled in South Australia, a relatively small sample, 36 per cent reckon blackouts can be attributed to privatization. To the question whether renewables were a solution for our future energy needs or a threat, the split was 64 per cent to 14 per cent. Of those polled in South Australia, 51 per cent think it is the solution and 19 per cent think it is a threat. On whether the Federal Government is doing enough to ensure affordable, reliable and clean energy for Australian households and businesses public opinion was even more stark, with 71 per cent of voters saying not enough was being done, and only 12 per cent saying enough was being done. 3 per cent said too much was being done. Even 62 per cent of Liberal National voters think the Federal Government is not doing enough. On building more coal fired power stations opinion is more divided but with more people opposed than supporting. The split is 45 per cent oppose to 31 per cent support. If you look at strongly oppose to strongly support the split is much higher with 20 per cent opposed to 7 per cent support. The feeling is much stronger opposing new coal fired power stations. The pollsters point out those most likely to support new coal fired power stations were Liberal/National voters (47 percent), men (39 per cent) and aged 65+ (53 percent). 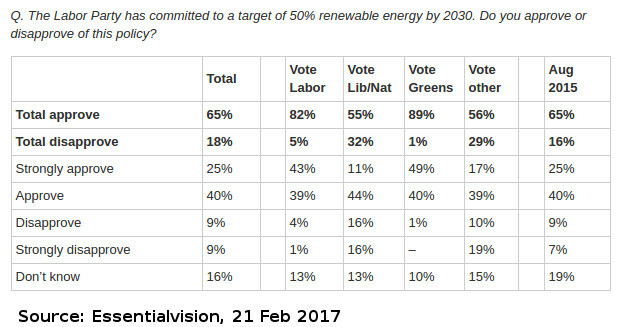 Those most likely to oppose new coal fired power stations were Greens voters (80 per cent) and Labor voters (51 percent). Interesting polling by the Australia institute in the Queensland electorate of Dawson. This is fertile ground for Pauline Hanson's One Nation Party and the polling found about 30 per cent of voters are considering voting for One Nation. The polling in Dawson for a 50 per cent renewables target by 2030 was supported across the board at 54.5 per cent, and opposition at 28.8 per cent. For intending One Nation voters it was 48 per cent support for the target, with 38 per cent opposing. “The Coalition will not win back voters with a war on renewables and company tax cuts for the big end of town." said Australia Institute director Ben Oquist. “On the contrary, this polling suggests that these positions could be driving their voters away." “One Nation support was highest among respondents aged 18-34 at 43.5%. Those younger voters also registered the highest support levels for a 50% renewable energy target." "Significantly, the poll finds One Nation voters in Dawson support a higher renewable energy target, with 48% of those intending to vote for One Nation wanting half of Australia’s electricity to come from renewable energy sources by 2030 and only 38% of One Nation voters opposing the idea." In Victoria polling shows an even greater awareness of climate change and support for action. A survey of 3333 Victorian voters, conducted in November and December 2016, was undertaken by Wallis Research for Sustainability Victoria (See Sustainability Victoria Social research page | Summary report PDF). This survey shows that the vast majority of Victorians expect state and federal government leadership to cut pollution and support renewable energy. Victoria tends to be much more concerned over climate and energy issues than the mining states of Queensland, Western Australia and South Australia. 91 per cent of Victorians assert that climate change is happening and that human activity is contributing to it. that the Australian Government should be leading action. 61 percent of Victorians think the Victorian government should be doing more on climate action while 20 per cent think enough is being done. 84 per cent of Victorians support the Victorian Renewable Energy Target (which has been opposed by the Victorian Coalition) Support increases to over nine out of ten among those aged 40 or under. Four out of five Victorians support the Andrews government target of net zero emissions by 2050, (which has also been opposed by the Victorian Coalition) Support increases 90 per cent among those aged 40 or under. 88 per cent say that that Local Government should be acting on climate change – most think they should contribute (55 per cent) rather than lead (33 per cent). Victorians have high self-efficacy with 82 per cent believing that "I can do meaningful things to reduce the impact of climate change”. Three-quarters of Victorians are interested in purchasing 100 per cent green power for their home. 70 per cent of Victorians are interested in solar battery storage systems. Over 50 per cent are interested in taking part in community renewable energy projects. Over 50 per cent are interested in buying an electric or more fuel efficient car. “This polling confirms that the vast majority of Victorians understand climate change is serious and urgent. We can already see climate change unfolding with damaging impacts across the state. Victorians expect their leaders to have a plan to tackle this massive threat to our way of life. “The Andrews government’s Climate Change Bill, if passed today, and the upcoming Victorian Renewable Energy Target, are significant reforms that will reduce Victoria’s greenhouse pollution and help us prepare for the impacts of global warming. These are exactly the sort of leadership actions that this poll finds Victorians support. “The poll raises serious questions about the wisdom of the Victorian Coalition’s opposition to the Climate Change Act and Victorian Renewable Energy Target. Not only is Matthew Guy’s position on these pieces of legislation irresponsible and reckless, it's also politically unpopular and out of step with Victorian attitudes. "Only a tiny minority of Victorians oppose reducing pollution in our economy – unfortunately many of them seem to reside in the Liberal party room. 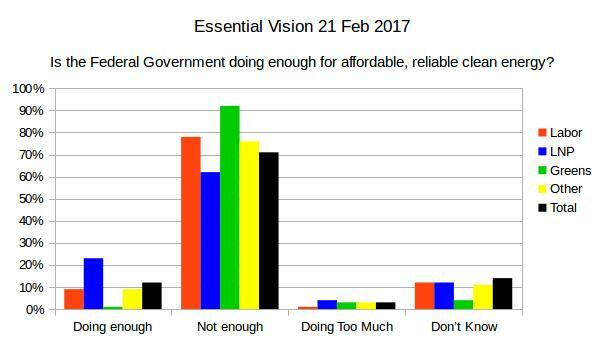 Data from Essential Vision polling. All graphs are my own work based on Essential Vision data.